Top half: suspicious baggie free. Now that's proper camera work. The Heat's bouncing baby boy Michael Beasley took to Twitter on Friday to show off a new tattoo -- and ended up in rehab for depression, among other things, a source has confirmed. 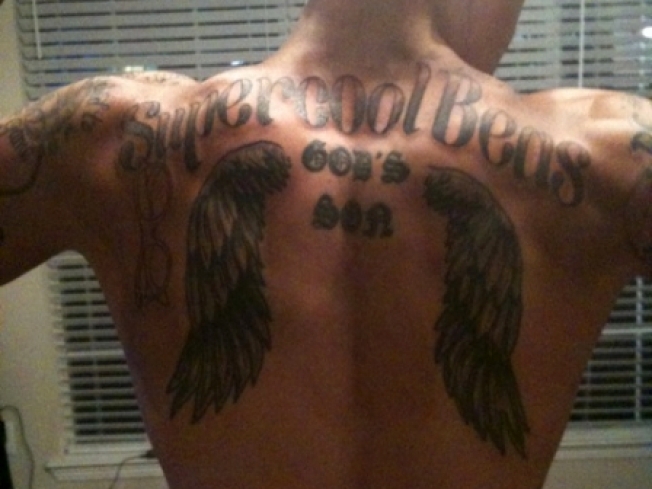 Surprisingly, the words "Super Cool Beas" inked across his back with sunglasses dangling next to a pair of wings weren't the notable part of Beas' TwitPic: in the background of the image sat two rather suspicious-looking baggies. Fans noticed the contents looked an awful lot like a substance to which kids should say no (though it's truly impossible to say for sure, especially when lawyers read this), and helpfully pointed it out in comments. Y do I feel like the whole world is against me!!!!!!! Back on my FTW!!!!! I can't win for losin!!!!!!!!!! not feelin this at all!!!!! Apparently Pat Riley wasn't feelin' this at all, either, because according to Yahoo! Sports' Adrian Wojnarowski, Beasley has checked into a Houston-area rehab facility run by former NBA player and coach John Lucas. The baggie buzz would certainly have angered Heat brass, though an indeterminable item in a fuzzy picture, taken in Beasley's own home, would in all likelihood have escaped punishment by the league. But accidentally posting an image with (alleged!) illegal substances was one more incident to add to the nagging immaturity and authority problems that have plagued Beasley since...ever, and his quasi-suicidal response is indicative of the trouble he's had dealing with NBA issues at 19 and 20. He told the Associated Press in January that many times during his first season, he felt "everyone was against me." He was fined $50,000 last fall for a pot-scented partying incident during the NBA's symposium teaching players how to avoid pot-scented party incidents. He was constantly fined for unnamed off-court violations throughout his rookie season. Teammates and coaches criticized -- sometimes publicly -- his poor concentration, lack of discipline, overall ability to annoy. The Heat even hired Alonzo Mourning to teach him how to function off the court, though clearly even Zo couldn't stop that tattoo from happening. “Based on what I’m getting right now, there’s a bit of concern,” Beasley's manager Bruce Shingler told the Associated Press. “I don’t really know what’s going on. I just know his mom is on her way to go see him in Houston. That’s it. I’m still collecting a lot of information. Janie Campbell believes in ballpark hot dogs and the pro-set. Her work has appeared in irreverent sports sites around the Internet.